This "Historically Speaking" column was published in the Exeter News-Letter on Tuesday, May 12, 2015. The Exeter Historical Society was recently asked by the Saco Museum in Maine if there were any examples of New England samplers in the collections and if we’d be willing to loan them for a summer exhibition called, “Industry and Virtue Joined: Schoolgirl Needlework and Female Entrepreneurs of Northern New England.” Our samplers would be displayed at the museum and later photographed and included in the Sampler Archive Project, a collaboration of the University of Delaware, the University of Oregon and the Sampler Consortium funded by the National Endowment for the Humanities. Five of our samplers have been included in this project. The oldest sampler in our collection is also the one we know the least about. It was donated to the Society in 1979 from the estate of Margaret Graney, an Exeter native who worked in Boston as a legal secretary most of her life. The sampler is the work of Fanny Hallett, who embroidered the date ‘1793’ onto the piece but provided no other information. Like all the samplers in our collections, the work is done with silk thread on linen fabric. Samplers were meant to highlight a girl’s ability to sew and decorate – an important skill for women to possess. The sampler was like a term paper – proving that a girl had mastered the stitches. Generally, samplers include renderings of the alphabet, printed capitals and lower case along with fancy script as well as text. In most cases, the text is religious in nature, but Fanny Hallett instead used a quote from the British poet Alexander Pope’s work Essay on Man: “Honour and shame from no condition rise, Act well your part there all the honor lies.” Was this a subtle comment on the nation’s new republican ideals? Perhaps. We know very little about Fanny Hallett. There were no families named ‘Hallett’ living in Exeter or the surrounding area in 1793, so the sampler must be from some other location originally. Two samplers that we can document well are those of Harriet Robinson and Martha Jane Elliot. Harriet stitched her name and, “aged 11 years Exeter 1839” onto her sampler. Martha Jane likewise included her name followed by, “age 12 years, Exeter, 1842” on her work. At the time they created the samplers, both girls were attending the Exeter Female Academy on Center Street. It is likely that it was at this school that the samplers were created. Along with the academic subjects taught at the school was a class in needlework. Both samplers follow the same basic structure: within an embroidered border, there are three lines of the alphabet (print, script, lower case) followed by a popular poem, “Pray Always” by Jane Simpson, which begins, “Go when the morning shineth, Go when the noon is bright.” Harriet called it simply, “Pray” and Martha titled it, “The Hour of Prayer,” but it is the exact same poem. Interestingly, Harriet and Martha became in-laws by marrying the Merrill brothers, Abner and Henry. Both couples spent their adult lives in Boston, although they visited Exeter often. Another sampler in our collections is that of Mary Shute. Like the Fanny Hallett sampler, Shute’s was also donated by the Margaret Graney estate. There were numerous Shute families in Exeter, but none of them had a daughter named Mary. 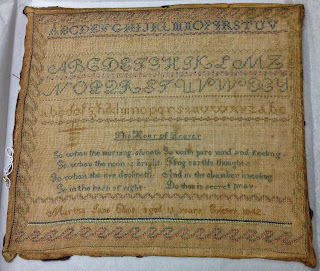 The sampler provides no clues, merely listing the maker as: “Mary Shute, aged nine yrs.” As such, we cannot even be assured the work was done in Exeter. 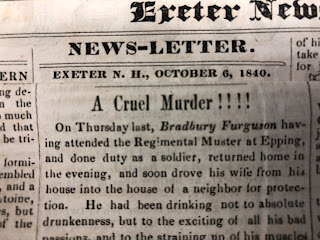 The style of the piece is different from those done at the Exeter Female Academy and a check of the student lists from the school yields no “Mary Shute.” However, there is a student named “Elizabeth Mary Shute” who attended in the early 1830s. It is possible – but not provable – that this is the same person. Elizabeth Mary Shute was born in 1825 and attended the Exeter Female Academy along with her sister, Emeline. 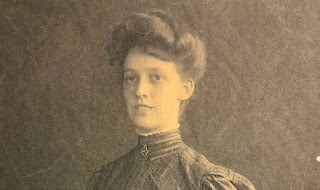 Elizabeth’s obituary from 1901 says of her, “As a child of tender years, Miss Shute sustained an injury which resulted in partial paralysis of her lower limbs.” She never married, choosing instead to live with her sister, Emeline, who married another of the Merrill brothers, Joseph. As tantalizing as this is, of course, we simply can’t be sure. The final sampler in the collection is quite similar to the two that were made at the Exeter Female Academy and the maker’s name is carefully stitched into it: “Sarah Jane Elliot, age 12, Exeter.” We presumed it would be simple to locate the maker and establish her family in town, but she remains elusive. Not related to Martha Jane Elliot, Sarah Jane could be one of two people – both born in 1844 (making this the youngest of the samplers, created about 1856). But we cannot place Sarah Jane Elliot, born 1844 to either James and Abigail Elliot of Chester or Ephraim and Sarah Elliot of Concord, in Exeter in 1856. She is also not listed in the catalog of the Exeter Female Academy. Sarah did not use Jane Simpson’s poem about prayer in her sampler, she used a common sampler verse, “Jesus permit thy gracious name, to stand as the first effort of an infant’s hand, and as her fingers on the sampler move, engage her tender heart to seek thy love with thy dear children may she have a part and write thy name thyself upon her heart.” Authorship of this verse is disputed. It may have been John Newton, of “Amazing Grace” fame, or Isaac Watts. But no matter whose verse it was, the sampler remains that the only evidence we have of Sarah Jane Elliot in Exeter. The Exeter samplers will be on display at the Saco Museum from May 9th through October 4th. Further information and hours are listed at: www.dyerlibrarysacomuseum.org. Photo: Sampler made by Martha Jane Elliot of Exeter in 1842. Elliot likely stitched her work as a student at the Exeter Female Academy, a private girl’s finishing school that was located on Center Street from 1826 – 1864. 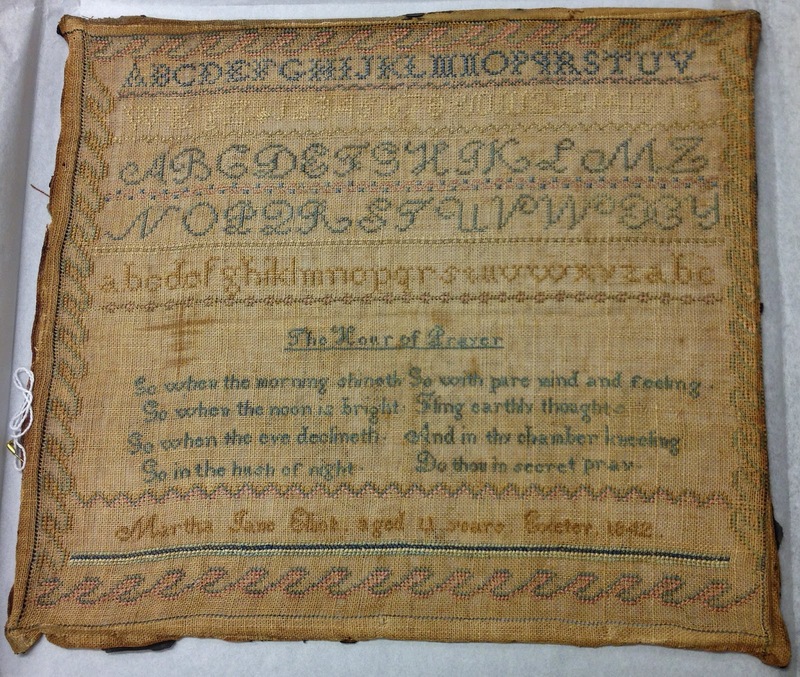 This sampler, and four others from the collections of the Exeter Historical Society, will be on display this summer at the Saco Museum in Saco, Maine.